Some thirty years in the future the war in orbit has left humanity without satellites, modern communications, or an escape from a sputtering planet. Angels are real, but there's nothing angelic about them; existence itself is a byproduct of their imprisonment around Earth. Then one of the Seraphim is murdered, and a low grade angel is tagged to kill a human and shore up the foundations of the collapsing paradox that is reality. Only the angel bungles the kill, and winds up with a lot more than anyone wanted. 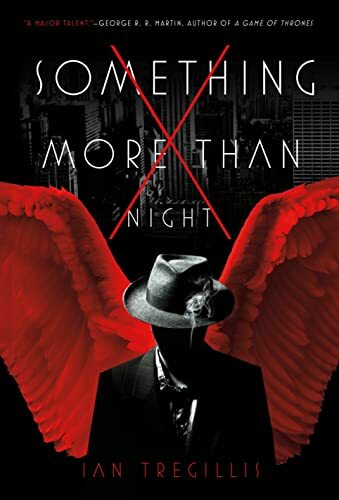 Ian Tregillis's Something More Than Night is part tongue-in-cheek noir detective story, part ontological examination of the foundations of reality, ever so slightly and amusingly absurd, and dripping with lush, weird descriptions. This is a book that arguably should not be, and one that certainly should not work. There are a lot of balls to keep in the air, most of them irregularly shaped and sharply edged, but Tregillis proves to be a skilled juggler. The narrative cuts back and forth between a first-person viewpoint of Bayliss, a low-ranking angel of middling powers, and a third-person perspective of Molly, a woman with an ex-lover and a junkie brother whose life gets even more complicated when Bayliss accidentally kills her to replace the murdered Seraph, Gabriel. The plot revolves around discovering who killed Gabriel and why, but as in any good noir detective story there are lots of run-ins with cops and toughs (here of the angelic variety), and plenty of suspicion and mystery to go around. Molly, meanwhile, wants to help her addict brother and reconnect with the lover who spurned her, but her new powers are unwieldy, and dangerous. There's enough intrigue to keep you wanting more, but while the plot is engaging and fast-paced, this book is much more than just a page turner. To explain why, a good place to start is with the frame of the story: in Molly's point of view, we are witnesses to the new, celestial state of being she inherits; we're confused when she's confused, and we discover as she discovers. In Bayliss's point of view, however, despite its being first person, the sense is that Bayliss is speaking to the reader, rather than us inhabiting his head. It's a performance, particularly when his most notable feature is taken into account: angelic provenance aside, Bayliss could be the detective in any hardboiled detective novel. He uses words like pill (cigarette), squiffed (died), loogan (guy with a gun), and twist (woman). He dresses the part, too, in his coat and fedora and constantly lit cigarette. The first-person narration initially draws us in with its laughable, albeit comfortable patina of familiarity. But over time that veneer wears thin, and we become more and more aware that his persona is a performance. But for whom? Much as the narrative perspectives become plot devices, so too does the hardboiled pulp noir homage that underpins the storyline. Reader reactions to the novel have been mostly mixed, generally either loving or hating it. For those in the latter camp, a common complaint has been the final plot twist at the end. Without giving too much away, I'll simply point out that the novel itself is aware of the improbability of this twist: "But why go to all this trouble?" Molly wonders as she begins to piece things together. "What did it achieve, turning himself into a hard-boiled detective pastiche in an archetypal story?" (p. 250). To me this suggests Tregillis knows what he is doing and did not, as has been suggested, merely try to write himself out of a corner. Molly's question, then, becomes the reader's question: why? What's it all for? In the end, the homage turned plot piece is cleverly done, and, like a Wes Anderson film, keeps the book rewarding for those who want to experience it more than once in search of answers. Part of the appeal of this book is how easy it is to let the language wash over you. Tregillis was originally a physicist before he turned to novels, and that deep knowledge of reality shines through in the novel's worldbuilding. Despite that, this doesn't read like a book written by a scientist. The language generally serves to advance the plot, but occasionally it also manages to be lush and lyrical and ever so strange, and I found myself wishing for more of these moments. For a great example of this, one need only open the first page: "Gabriel streaked across the heavens like a tumbling meteor, his corpse a fireball of sublimated perfection. He had been a creature of peerless majesty, but now the throes of his death etched the firmament" (p. 11). A personal favorite, which echoes China Miéville and weird fiction, appears several chapters later: "From a wisp of magnesium (itself a sentimental remnant of an older star), Gabriel had hung fragments of conflicting realities like pearls on a string. Slivers of might-have-beens, universes with different fine structure constants, different electroweak coupling constants, different causality, no causality . . . He'd been charting the ontological boundaries of mortal existence" (p. 65). The text moves from lyrical moments like these, to more plot-driven narrative I wanted to skim, to other places where I wanted to pause and digest. This can make for an odd reading experience, and causes the novel to feel a bit disjointed. But given the bifurcated nature of the narrative, I'm willing to believe we're intended to be put off guard, to be unsettled. Another way Tregillis achieves this unsettling is through taking well-trodden subjects like angels and the detective novel and mixing them up so they become unfamiliar and fresh: Aquinas's heavenly choir becomes a selfish, human-hating group of manacled demigods; the detective in the fedora becomes a sleazy angel who works too hard at maintaining his script and might not be as trustworthy as we originally assume. One area that fell somewhat short for me was the book's characterization: Bayliss is essentially a cardboard cutout. He's necessarily so, for plot reasons that I won't divulge, but this means the book's other characters really need to carry the show. And, admittedly, for the most part Molly does. She's interesting: somewhat innocent and bumbling, but filled with a fierce devotion to the people she loves—even when it almost kills them. I liked her a lot. But this is essentially a two character show sparsely populated with extras. In terms of secondary characters, we've got Molly's brother, a drug addict who is shattered by his sister's gruesome death, and Anne, the woman Molly is attracted to and who becomes the key to unraveling the mystery. But I wouldn't say they are terribly interesting or engaging. This leaves Molly to carry the entire novel, which she nearly pulls off. Character development aside, this is a hugely ambitious novel in both function and form. It takes a particularly deft touch to manage all the disparate elements here, but Tregillis doesn't stop at ambitious; not only does he not shy away from difficult subjects like death and love and the afterlife, he takes them head on and recasts them so we see them anew. For example, there is a moment when Molly starts doubting and even hating herself for not "coming out" to Anne and telling her she's not human, which is at once laugh-out-loud funny and poignant. "So she masqueraded as a human, choosing to stay in the closet just a little bit longer . . . Hating her selfishness. Hating her cowardice" (p. 194). The notion of an angel being afraid to come out to her lesbian lover could easily become absurd, but Tregillis pulls it off well and captures the real, human emotion of the situation. Overall, this is a difficult book to nail down into any particular category. I found myself greatly admiring it at times, and fiendishly turning pages at others; but there were also times that I put the book down and didn't mind letting it rest for a day or two while I thought it over. All the homages and flourishes aside, we're left with a novel that asks some really big questions about life and love and death, and everything in between. And while some readers may be disappointed that the book doesn't provide answers to those questions, I suspect Tregillis puts a lot of faith in his readers and is content to let us, as he does with Molly, work it out for ourselves. Perhaps the most apt description of the book comes from the text itself when Molly is speaking to Anne (from whom, like Tregillis with his readers, she is hiding things): "I don't know why any of this is important. Or even if it is. Maybe it isn't. I'm just trying to make sense of the world" (p. 180). Aren't we all? A. S. Moser is a writer currently living in Hong Kong. His current project is a science fiction novel about death, hacking, and Dylan Thomas. For more, visit his blog, or follow him on Twitter.